by Professor Dr.Dr.h.c. Randolph Riemschneider, Life B.Fel. CO2 has many faces: In the 1940s we started for the first time reactions in liquid CO2 . Without CO2 there is no photosynthesis - no life. In the current newspapers it reads: greenhouse gas CO2 – climate-killer. This statement cries for explanation. So I wrote this essay: “Natural CO2, Anthropogenes CO2, and the So-Called Greenhouse CO2, A Semantic Case”. Climate changes are given by nature. Natural climate changes have been in the past and will be in future. As long as the weather changes, the climate will change with it . The weather derives its energy primarily from the sun - this involves forces we cannot compete with. The influence of the CO2 produced by engineering is marginal. More than 95% of CO2 comes from natural sources and therefore is not anthropogene. I hope my offered text is clear enough. Questions triggered through my essays “Energy Sources”  encouraged me to do it. The topics briefly addressed in these essays had triggered questions concerning the so-called greenhouse gases CH4 and CO2 which have to be answered to avoid misunderstanding. The term “greenhouse gas CO2” is misleading and encouraging the “climate lie”. For many years, some politicians have been demoting the essential CO2 (Re I) from natural and anthropogenic sources (Re II) to the so-called greenhouse gas CO2 (Re III) to abet the lie about a change in climate (Re IV). The arguments of critics (Re V) have found and still find far too little attention [2-7]. Significance of CO2 , O2, and H2O for the life on earth: Photosynthesis (eq 1) and biological oxidation (eq 2) in vegetal and animal cells. We are living in a so-called "oxidizing atmosphere". [Regarding a conceivable "reducing atmosphere" based on CH4 + H2O, please refer to SPECIAL PART C) and ]. On earth, water is an essential prerequisite of life. Nothing could be done without water. The water shown on the right-hand side of equations 1 and 2 is not identical with the one used. Water is also a key element for the energy balance on earth. Solar energy drives a water cycle which, in turn, is an important factor influencing the temperature on the surface of the earth. Both the weather and the climate derive their energies from the sun. Equations 1 and 2 show the significance of CO2, O2 and the photosynthesis for our life. "Be in awe of plants, because all life comes from them" reads the inscription at the entrance of the Berlin Botanical Garden. As far as CO2 is concerned, we have to distinguish between natural, anthropogenic, "greenhouse gas CO2" , and the defamed CO2 - and an acquittal is demanded for the latter, because the alleged change in climate is a huge swindle! - The share in total CO2 resulting from anthropogenic activities: combustion of coal, natural gas and petroleum, from agriculture, livestock farming, forest clearance by fire: < 5%. - The share in total CO2 from natural sources, i.e. the oceans, weathering of carbonates, respiration of living beings including microorganisms [microorganisms are producing far more CO2 than industry], decay, volcanism: > 95%. These figures alone prove the nonsense spouted by the "preachers for climate" and self-appointed "greenhouse experts". For more about the so-called greenhouse gas CO2, please refer to Sec. III. Two thirds of the earth are covered by oceans. Fifty to sixty times the amount of CO2 compared to that contained in the atmosphere is dissolved in the seas. In this respect, the temperature plays an important role: CO2 is released when the temperature rises; when it drops, more CO2 is dissolved in the seas. Heating is the cause of more CO2 rather than its effect! The climate hysterics confuse cause and effect. The CO2 content of the earth's atmosphere follows the temperature of the land and the sea, but does not cause any climate changes itself. CO2 increase in earth's history: Every time the CO2 level increased after a rise in temperature, i.e. it is the consequence rather than the result of such an increase. The misleading term "greenhouse CO2"
The sun as our only external source of energy heats the earth day by day, thus compensating the energy loss occurring every night. The earth is an open eco-system - open meaning "no roof", "no house", i.e. the earth is not a closed system like a greenhouse. What the sun does day by day can be observed in desert regions: strong radiation and cooling at night, heating during the day, i.e. extreme variations - quite the opposite of a greenhouse. Mankind has lived in this rhythm of "heating - cooling - heating - cooling" since the beginning and will certainly continue to do so in future. This has practically nothing to do with the CO2 level of the air which amounts to 0.038 %. According to the laws of physics, no body emitting radiation is capable of heating itself with such emitted energy . - "Greenhouse gas CO2" in climatology and the interpretation of the term by various politicians and "preachers for the protection of the climate". Charts 1 and 2 once again show that the earth is not a greenhouse. 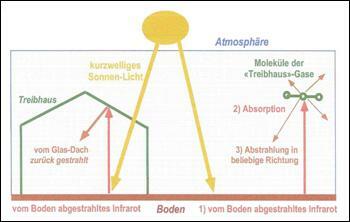 It is shown how the energy of the incident sun rays absorbed by the surface of the earth in a free atmosphere (rather than through a glass roof) is accounted for by different physical processes. “A large part of the short-wave and visible light emitted from the sun penetrates the glass of the greenhouse, heats its bottom which, in turn, heats the air above by heat conduction and convection. This air remains trapped in the greenhouse; the inside is warmer than the outside - a true greenhouse effect. The heat stored in the locked-in air has nothing whatsoever to do with the phenomenon of the same name cited by climatologists. In climatology, the greenhouse effect is a catchword which illustrates the property of the atmosphere to let most of the visible incident light through, but (and) to absorb the longer-wave "back radiation" (IR radiation) to a greater extent. When speaking about a greenhouse effect in general, this often means additional warming allegedly caused by a an increase in the concentration of so-called greenhouse gases. Greenhouse gases are: primarily water vapour (20 to 25), followed by CO2 (7), CH4 (0.5), N2O (0.3), O3, CFC [13-15]. The numbers in round brackets represent the extent of an estimated greenhouse effect, i.e. the heat radiation of absorbing gases. It is not CO2, but water vapour - which usually nobody thinks of when talking about greenhouse gases - that has the strongest effect! Water vapour will increase in response to global warming, which in turn may enhance global warming. “We start by assigning an arbitrary measure of 100 units as the amount of solar energy received at the top of our atmosphere. The atmosphere and its elements (clouds , particles, molecules) reflect about 26 units back out to space and absorb another 19 units. The remainder of the energy passes through the atmosphere, with much of it (51 units) being absorbed by the Earth's surface. Essentially, the energy absorbed by the land and the oceans is what drives atmospheric and ocean­ic circulations. Finally, about 4 units of the energy are reflected by the surface. Virtually all of the energy that heats the Earth's surface is then transferred to the atmosphere and to space by several dif­ferent mechanisms. First, all surfaces radi­ate (give off) energy back through the atmosphere toward space. Also, heating from the Earth's sur­face causes upward motion of the air above (convection) and changes the state of water from liquid to vapor form (evaporation). Convection, evaporation, and radiation from the sur­face exceed the total amount of energy that was absorbed by the surface to begin with! This is impossi­ble unless there is a missing element of the energy budget. In fact, there is: the Earth's atmosphere con­tains water vapor, carbon dioxide, and other green­house gases, which absorb energy radiated toward space and then emit some to space and some back to the Earth's surface.” – Not to forget: Clouds also play an important role in our climate system ; cf. also SPECIAL PART A). On the topic of climate forecasts: Meteorologists even run into difficulties when asked to make a weather forecast for a short time, for example one week, let alone make a climate forecast: In meteorology, climate means the weather in a certain region for a period of 30 years. Nor do we have any influence either on the weather or on the climate: As long as the weather changes, the climate will change with it . The weather derives its energy from the sun - as already mentioned above, this involves forces we cannot compete with. The term "greenhouse gas CO2" has been played up by some politicians, especially members of the Green Party. They use it as a scientific excuse of the climate swindle and the greenhouse swindle. As stated several times before - the earth is not a greenhouse. After the "Waldsterben", the death of forests caused by acid rain, pushed by the Green Party in the 1970s and 80s, they forecasted a number of other deaths - among them that of the oceans - and, after the ozone hole had served its purpose, arrived at the “climate catastrophe via climate protection”. Out and out material interests hide behind the stated demands of the eco-activists which appear idealistic to others. Just one example - the obscure trade with contamination certificates such as CO2 certificates has reached the billion range - to protect something which is, by nature, undefined: climate religion. Just think of the selling of indulgences by the Catholic church in the 16th century. In order to convince us to build new coal power plants, politicians try to make us believe that the CO2 emission of coal power plants can be eliminated by expensive CCS methods, even though it is known how much energy it would cost to cool, wash and reheat CO2 and then to "store" it permanently. P. Helmes  says in his essay "The Riders of the Apocalypse": "We are on our way to an eco-socialist dictatorship where citizens are told how to live, to breathe, to consume, to work. Under the guise of 'protection of the environment and the climate', the greatest redistribution of wealth in the history of mankind threatens. 'Green politics' are by no means based on clean ecological intentions, but purely ideological motives directed at questioning the free-market order of Western states and ruining them as a result." Dr. W. Thüne , climate expert of the German TV channel ZDF and holder of a diploma in meteorology, has given detailed comments on the topic "greenhouse swindle", "greenhouse swindle system" in the TV programme "Deutschland Magazin"; additional information in "Die grüne Gefahr" (The Green Danger) . The comment on the climate conference in Copenhagen made by Dr. K.P. Krause  (editor for commercial issues at FAZ for 35 years, freelance journalist) to the forum "Junge Freiheit" on 4 December 2009 also belongs in this category: "There is not a single scientific proof that higher CO2 levels have any significant influence on the climate. The CO2 content of the earth's atmosphere varies. It has always done, without any contribution from man. - What is decisive for the earth's climate is the sun." W. Furrer , holder of a university degree in mathematics and author of non-fiction books proposes a "constitutional initiative in Switzerland" in his article "Climate change? - Climate lie!" in the political section, phrasing a manifest and an appeal to governments: SPECIAL PART B). It is not without reason that, for many years, the United States have taken a very critical position in climate conferences and refuse to sign certain protocols. In closing, let me refer to the fact that the period of warm weather presently registered started at the end of the last Minor Ice Age, i.e. around 1800, i.e. long before the increase in CO2 now observed. In the past 10 millennia since the end of the First Ice Age, warming has taking place several times which has nothing to do with burning fossil fuels. 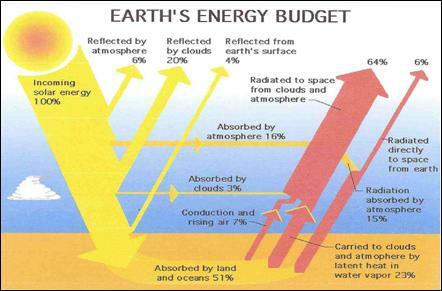 We do not need the greenhouse effect to explain climate variations which are normal per se: The atmosphere which is continuously in more or less turbulent movement and the oceans transport heat from one place to the other, either short term (weather) or long term (climate) and influence the energy balance described in Chart 3. The result is, for example, variations in temperature. Such variations do not need to have specific causes. As already said above: man is - thank God - unable to influence the climate. I demand acquittal for the anthropogenic small amounts of CO2 (3 to 5 % of the overall CO2 produced)! The manhood is powerless against the global change of climate. Man can influence neither the "activities" of the sun which is primarily responsable for the climate on earth, nor the omnipresent galactic radiation (protons, electrons, ionised atoms) nor the geothermal behaviour of our earth. Not to forget the influence of the moon . Man has been powerless in the past to stop the natural climate change and the natural influences and will be no more successful in future. There have been various climate changes even before man invented the engine. So far, climate change was countered by looking for regions with a better climate ("Völker­wanderung"). Something like that will happen again, but will be far more difficult at a population of 7 to 9 billion people. Solar winds are streams of charged particles blown into space by the sun. The magnetic field of the sun influences the climate on earth, depending on whether its magnetic field allows a lot or a little of cosmic radiation to come through. Certain connections, namely parallelism, have been found between the magnetic solar activity, cosmic galactic radiation, on the one hand and the earth's climate and cloud formation influencing earth's temperature on the other. Ionised aero-particles as condensation nuclei are a prerequisite for cloud formation. The cloud cover reflects (or absorbs) sunlight and thus reduces (or raises) the temperatures on earth, depending on whether cosmic radiation from space increases (or decreases). The sun controls the intensity of its radiation by its magnetic field. The latter has doubled over the past 100 years, i.e. less radiation reaches the atmosphere of the earth, meaning that less clouds are formed. The result: increased warming. In other words, space has a direct impact on our earth. The author pointed to the importance of clouds  for the climate as early as 1941. At that time, however, the scientific community was of the opinion that clouds are the result of the earth's climate, while the opposite is probably the case. "The climate is the result of the cloud density" if the above information supported by statistics and experiments is correct : H. Svensmark, "Zusammenhänge magnetischer Sonnenaktivität, kosmischer Strahlung, und der die Erdtemperaturen regulierenden Wolkenbildung" (Correlation between magnetic solar activity, cosmic radiation, and cloud formation adjusting the earth's temperature). 1 Die Schweiz anerkennt weder verbindliche Prognosen über die Entwicklung des Klimas noch Verfahren, dieses in nützlicher Weise zu lenken oder zu schützen. 2 Sie ergreift keine Massnahmen und beteiligt sich nicht an völkerrechtlichen Verträgen, die für Zwecke nach Absatz 1 propagiert oder gefordert werden. 3 Abgaben, Subventionen, fiskalische und sonstige staatliche Vergünstigungen mit dem Zweck, das Klima zu beeinflussen, sind verboten. Art. 197 Ziff. 8 (neu) Uebergangsbestimmung zu Art. 135a (Verbot von Abgaben und Subventionen für Massnahmen zur Beeinflussung des Klimas): 1 Gesetze, die im Widerspruch stehen zu Artikel 135a, gelten als aufgehoben mit der Annahme von Artikel 135a durch Volk und Stände, gegebenenfalls nach Ablauf der Kündigungsfrist entsprechender völkerrechtlicher Verträge. 2 Bereits bestehende derartige Verträge werden auf den frühestmöglichen Zeitpunkt gekündigt. Die Unterzeichnenden sind empört über die staatlich verordnete Glaubens-Lehre, wie sich das Klima angeblich entwickeln werde, eine Lehre, die auf keinen seriösen wissenschaftlichen Grundlagen beruht, jedoch für vielerlei groben, zum Teil bösartigen Unfug missbraucht wird. Bösartig ist es, in einer Welt, in der viele Menschen an Hunger leiden, Rohstoffe, die als Nahrungsmittel dienen sollten, staatlich gefördert als Treibstoff zu verwenden. Ebenfalls bösartig und obendrein dumm ist es, die immer selteneren tropischen Wälder mit all ihren Pflanzen und Tieren für solche Zwecke abzuholzen. Unanständig ist es, weltweit Konsumenten und Wirtschaft gestützt auf wissenschaftlich nicht haltbare Theorien mit Abgaben zu belasten. Die Regierungen werden aufgefordert, dieses Treiben einzustellen und die an Hochschulen systematisch zum Schweigen gebrachten Kritiker der offiziellen Klima-Theorien zu Wort kommen zu lassen. In Sec. 1, an oxidising atmosphere has been described: Formation of one or more organic substances by photosynthesis (eq 2) and degradation by biological oxidation (eq 1). A corresponding reducing atmosphere using H2 , CH4 and H2O instead of O2 , CO2 und H2O is shown by eq 3 and 4 . Such reactions might occur on the moon Titan and may be „utilised by organisms living there“. Chemistry in fl. CO2 : in the 1940s - CO2 → CH4 (1970)  - the so-called geenhouse gas CO2: 70 years later. Die Erde strahlt wie jeder feste oder flüssige Körper in Abhängigkeit von seiner Temperatur laufend Wärmeenergie ab. 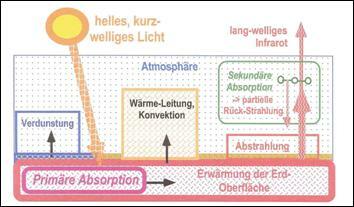 Da Gase Strahlung nur selektiv absorbieren und wieder emittieren können, ist die Atmosphäre sowohl für das Sonnenlicht als auch für das unsichtbare „Erdlicht“ weitestgehend durchlässig. Die Luft wird vom Boden her erwärmt und auch gekühlt. Nochmals: Kein Körper kann sich mit der ihm eigenen inneren Energie erwärmen, selbst wenn die von ihm abgestrahlte Energie aus kalten Höhen als Gegenstrahlung“ gänzlich zu ihm reflektiert werden würde. Fonds der chemischen Industrie e.V. Summary: Sonne sorgt aktiv für Erwärmung, „passive“ Energie verzögert den Abfluß und damit die Abkühlung. Wolken bei Tag über Land spenden Schatten, Land darunter wird weniger warm („passive Kühlung“), Regen würde zusätzlich für Abkühlung sorgen. Wolken über den Meeren dämpfen die Verdunstung und verhindern weitere Wolkenbildung. Die Wirkung von Wolken / Wasserdampf ist entscheidend für das Klima, andere Gasen wie CO2 spielen nur eine geringe Rolle. Je mehr Energie in der Atmosphäre, um so mehr Verdunstung, um so mehr Niederschläge und Temperatursenkung - im Sinne einer „dämpfenden Rückkopplung“. The influence of the moon on the earth climate is not to be neglected. Without our trabant the earth axis would be instable with great consequences on our climate. The moon is stabilizing the rotation axis of our earth, very important for the climate and the life on earth: our seasons depend on the angle of inclination. The eclipsis influences the distribution of sun energy on the surface of the earth. Tides driven by the moon slow down the earth rotation. Every year the moon increases his distance to the earth a little. Without the moon the earth axis would not be stable any more. With consequences for the development of the live on earth , the earth would rotate faster, no brake of the earth rotation through tidal effect. That means shorter days (8-15 hours instead of 24 hours), influence on the magnetic field, other calendar, and for the tides the sun would be responsible. Chemistry and toxicology of the HCH-group: PROJ IX in, l.c. Part III, p 154/5, 341. R.Riemschneider, l.c. Introduction in Part I, pp 9 and 11. This paper was received on February 5, 2010 and re-edited, updated, and completed on December 12, 2011.